Irene Grosvenor Wheelock was born in 1867 in Monroe, Michigan, but lived most of her life in the San Francisco Bay area in San Jose and the Santa Clara Valley. Her family was friends with John Muir. Wheelock wrote about California bird species based upon her own observations in the field. Occasionally, she received criticism for not utilizing collected specimens in her studies. 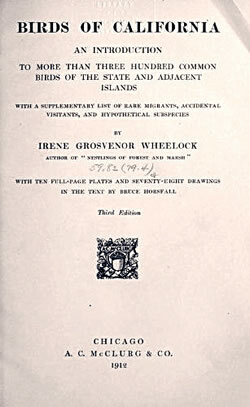 Irene Grosvenor Wheelock is best known for two publications. In 1903, she wrote “Nestlings of Forest and Marsh,” in The Auk: A Quarterly Journal of Ornithology, Volume 20 (New York: L/S/ Foster, 1903). And in 1904, her most widely read book was published. It was entitled Birds of California: An introduction to more than three hundred common birds of the state and adjacent islands (Chicago: A.C. McClurg, 1904). The book considered the biology, range and status of birds throughout the state, with a special emphasis on birds in her home area of the South Bay Area. The book’s consideration of the feeding habits of young birds was considered pioneering by some prominent ornithologists. This book is a noteworthy contribution to the literature of ornithological biography. The author states that field notes begun in 1894 form the basis of the following pages and give a list of twenty localities from the Colorado River and San Diego to Mt Shasta from the Farallones to Tahoe at which she has pursued her studies of birds chiefly during the nesting season …. Mrs. Wheelock's evidently wide experience commands for her observations the respectful consideration of those who have not been privileged to have her time and opportunities for field work. Her biographies abound with interesting and novel descriptions of the habits of birds …. The book should…prove a potent incentive to California field workers and assuredly no one who proposes to study the habits of birds in the West can afford to be without it. Irene Grosvenor Wheelock died in 1927 at the age of 62.